In this post I go over how to extract a player's shot chart data and then plot it using matplotlib and seaborn. Getting the data from stats.nba.com is pretty straightforward. While there isn't a a public API provided by the NBA, we can actually access the API that the NBA uses for stats.nba.com using the requests library. This blog post by Greg Reda does a great job on explaining how to access this API (or finding an API to any web app for that matter). The above url sends us to the JSON file contatining the data we want. Also note that the url contains the various API parameters used to access the data. The PlayerID parameter in the url is set to 201935, which is James Harden's PlayerID. Create a pandas DataFrame using the scraped shot chart data. The above shot chart data contains all the the field goal attempts James Harden took during the 2014-15 regular season. They data we want is found in LOC_X and LOC_Y. These are coordinate values for each shot attempt, which can then be plotted onto a set of axes that represent the basketball court. Lets just quickly plot the data just too see how it looks. Please note that the above plot misrepresents the data. The x-axis values are the inverse of what they actually should be. Lets plot the shots taken from only the right side to see this issue. As we can see the shots in categorized as shots from the "Right Side(R)", while to the viewers right, are actually to the left side of the hoop. This is something we will need to fix when creating our final shot chart. But first we need to figure out how to draw the court lines onto our plot. By looking at the first plot and at the data we can roughly estimate that the center of the hoop is at the origin. We can also estimate that every 10 units on either the x and y axes represents one foot. We can verify this by just look at the first observation in our DataFrame. That shot was taken from the Right Corner 3 spot from a distance of 22 feet with a LOC_X value of 226. So the shot was taken from about 22.6 feet to the right of the hoop. Now that we know this we can actually draw the court onto our plot. The dimensions of a basketball court can be seen here, and here. Using those dimensions we can convert them to fit the scale of our plot and just draw them using Matplotlib Patches. We'll be using Circle, Rectangle, and Arc objects to draw our court. Now to create our function that draws our basketball court. NOTE: While you can draw lines onto the plot using Lines2D I found it more convenient to use Rectangles (without a height or width) instead. Now plot our properly adjusted shot chart data along with the court. We can adjust the x-values in two ways. We can either pass in the the negative inverse of LOC_X to plt.scatter or we can pass in descending values to plt.xlim. We'll do the latter to plot our shot chart. Lets orient our shot chart with the hoop by the top of the chart, which is the same orientation as the shot charts on stats.nba.com. We do this by settting descending y-values from the bottom to the top of the y-axis. When we do this we no longer need to adjust the x-values of our plot. Lets create a few shot charts using jointplot from seaborn. 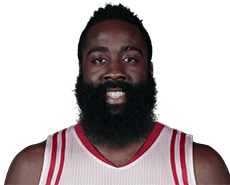 We could also scrape Jame Harden's picture from stats.nba.com and place it on our plot. We can find his image at this url. Now to plot Harden's face on a jointplot we will import OffsetImage from matplotlib.Offset, which will allow us to place the image at the top right corner of the plot. So lets create our shot chart like we did above, but this time we will create a KDE jointplot and at the end add on our image. And another jointplot but with hexbins. EDIT: Based on /u/Ogi010 's suggestion, I recreated the KDE plot using the new Viridis matplotlib colormap (which you can find here). I created a module that contains all of the abover functionality, which you can find here. There is this cool package by Bradley Fey, that lets you access alot of the stats.nba.com data in a nice Python wrapper. If you see any issues or have any questsion, leave a comment below. First off thanks for all the kind words regarding this post. I'm glad people found it useful. If you have any questions or suggestions and want to get into contact with me the best way is by email (savvas.tjortjoglou@gmail.com) or Twitter (@savvas_tj), though I'm not that active on Twitter.